Natural clay systems, commonly referred to as bentonite, are composed primarily of montmorillonite clay. This natural material is used commercially in a wide range of products including toothpaste. Typically, bentonite waterproofing systems contain 85–90 percent of montmorillonite clay and a maximum of 15 percent natural sediments such as volcanic ash. After being installed in a dry state, clay, when subjected to water, swells and becomes impervious to water. This natural swelling is caused by its molecular structural form of expansive sheets that can expand massively. The amount of swelling and the ability to resist water is directly dependent on grading and clay composition. Clay swells 10–15 percent of its dry volume under maximum wetting. Therefore, it is important to select a system high in montmorillonites and low in other natural sediments. Bentonite clay is an excellent waterproofing material, but it must be hydrated properly for successful applications. Clay hydration must occur just after installation and backfilling, since the material must be fully hydrated and swelled to become watertight. This hydration and swelling must occur within a confined area after backfill for the waterproofing properties to be effective. Precaution must be taken to ensure the confined space is adequate for clay to swell. If insufficient, materials can raise floor slabs or cause concrete cracking due to the swelling action. Clay systems have the major advantage of being installed in various stages during con- struction to facilitate the shortening of the overall building schedule or reducing any impact the waterproofing system installation might have. Clay systems can be installed before concrete placement by adhering the waterproofing product to the excavation lagging system as shown in Fig. 2.80, or against slurry walls or similar excavation and foundation support systems as detailed in Figs. 2.81 and 2.82. FIGURE 2.80 Clay system applied directly to foundation lagging. FIGURE 2.81 Clay system applied directly to shotconcrete foundation wall. FIGURE 2.82 Application of clay panels directly to foundation sheet piling. Clay systems can also be applied to the inside face of concrete formwork that is intended to be left in place due to site access constrictions; a similar installation photo- graph in shown in Fig. 2.83. These application methods permit the contractor to provide an effective waterproofing installation without having to delay the schedule awaiting the concrete placement and curing time necessary for other types of below-grade products. 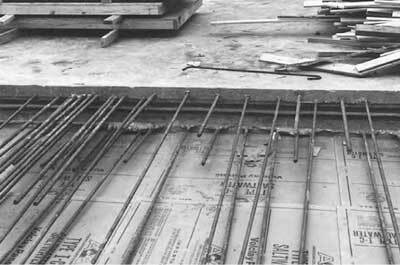 FIGURE 2.83 Clay membrane applied to inside of concrete formwork. This also holds true for the typical waterproofing of elevator pits shown in Fig. 2.84. Here the clay panels are laid directly on the compacted soils before concrete placement, without a working or mud slab required for the waterproofing installation. Again, this can save not only construction time but associated costs as well. FIGURE 2.84 Typical clay system detailing for elevator pit with no mud slab required. There is no concrete cure time necessary, and minimal substrate preparation is necessary. Of all waterproofing systems, these are the least toxic and harmful to the environment. Clay systems are self-healing, unless materials have worked away from a substrate. Installations are relatively simple, but clay is extremely sensitive to weather during installation. If rain occurs or groundwater levels rise and material is wetted before backfilling, hydration will occur prematurely and waterproofing capability will be lost, since hydration occurred in an unconfined space. Immediate protection of applications is required, including uses of polyethylene covering to keep materials from water sources before backfill. If installed in below-grade conditions where constant wetting and drying occurs, clay will eventually deteriorate and lose its waterproofing capabilities. These systems should not be installed where free-flowing groundwater occurs, as clay will be washed away from the substrate. Bentonite clays are not particularly resistant to chemicals present in groundwater such as brines, acids, or alkalines. Bulk bentonite is supplied in bulk form and spray-applied with an integral adhesive to seal it to a substrate. Applications include direct installations to formwork or lagging before foundation completion in lieu of applications directly to substrates. Materials are applied at quantities of 1–2 lb/ft^2. Bulk bentonite spray applications provide seamless installations. Controls must be pro- vided during application to check that sufficient material is being applied uniformly. Materials should be protected by covering them with polyethylene after installation. Due to possibilities of insufficient thickness during application, manufacturers have developed several clay systems controlling thickness by factory manufacturing, including boards, sheets, and mat systems. Bentonite clays are packaged in cardboard panels usually 4 ft^2, containing 1 lb/ft^2 of bentonite material. Panels are fastened to substrates by nails or adhesives. Upon backfilling, panels deteriorate by anaerobic action, allowing groundwater to cause clay swelling for water- proofing properties. On horizontal applications the panels are simply laid on the prepared substrates and lapped (Fig. 2.85). These systems require time for degradation of cardboard panels before swelling and watertightness occurs. This can allow water to penetrate a structure before swelling occurs. As such, manufacturers have developed systems with polyethylene or butyl backing to provide temporary waterproofing until hydration occurs. Panel clay systems require the most extensive surface penetration of clay systems. Honeycomb and voids should be filled with clay gels before panel application. Special prepackaged clay is provided for application to changes in plane, and gel material is used at protrusions for detailing. Several grades of panels are available for specific project installation needs. These include special panels for brine groundwater conditions (Fig. 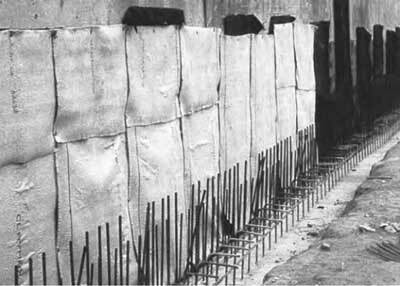 2.86), and reinforced panels for horizontal applications where steel reinforcement work is placed over panels. 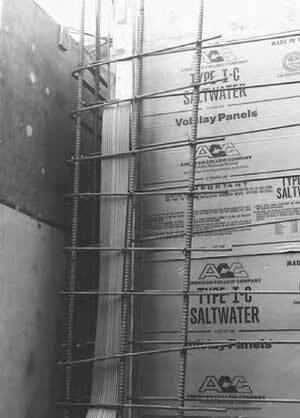 FIGURE 2.86 Saltwater panel application. Panels are lapped onto all sides of adjacent panels using premarked panels that show necessary laps. Bentonite sheet systems are manufactured by applying bentonite clay at 1 lb/ft^2 to a layer of chlorinated polyethylene. They are packaged in rolls 4 ft wide. The addition of poly-ethylene adds temporary waterproofing protection during clay hydration. This polyethylene also protects clay material from prematurely hydrating if rain occurs before backfilling and adds chemical-resistant properties to these systems. Some manufacturers have developed sheet systems for use in above-grade split or sandwich slab construction. However, constant wetting and drying of this system can alter the clay’s natural properties, and waterproofing then depends entirely upon the polyethylene sheet. Bentonite and rubber sheet membrane systems add clay to a layer of polyethylene, but also compound the bentonite in a butyl rubber com position. Materials are packaged in rolls 3 ft wide that are self-adhering using a release paper backing. They are similar to rubberized asphalt membranes in application and performance characteristics. These combination sheet systems are used for horizontal applications, typically split- slab construction in parking or plaza deck construction. As with rubberized asphalt sys- tems, accessories must be used around protrusions, terminations, and changes in plane. The polyethylene, butyl rubber, and bentonite each act in combination with the others, providing substantial waterproofing properties. Unlike other clay systems, concrete substrates must be dry and cured before application. Care must be taken in design and construction to allow for adequate space for clay swelling. Bentonite mat systems apply clays at 1 lb/ft^2 to a textile fabric similar to a carpet backing. This combination creates a carpet of bentonite material. The coarseness of the fabric allows immediate hydration of clay after backfilling, versus a delayed reaction with card-board panels. The textile material is not self-adhering, and adhesives or nailing to vertical substrates is necessary. Protection with a polyethylene sheet after installation is used to prevent pre- mature hydration. This system is particularly effective in horizontal applications where the large rolls eliminate unnecessary seams. This lowers installation costs as well as prevents errors in seaming operations. Properties of typical clay systems are summarized in Table 2.8. My father works in a software development company, which opened its branch office in another city a few months ago. Being a senior official, he was transferred to the newly opened office to recruit computer engineers and run the business activities smoothly. Therefore, my mom had to accompany him, and I was shifted to college hostel. Since, out home remained neglected for two months, I felt dismayed to see dampness all around the kitchen sink. I decided to call waterproofing experts immediately, and I got the useful reference through the internet.